Note: The right-hand village should be owned by the white pagoda player as there are 3 white pagodas connected to it compared to 2 black pagodas. Qin is a tile-laying game with a Chinese theme by Reiner Knizia. 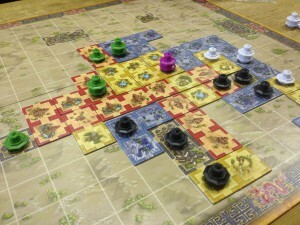 The winner is the first player to place all of their pagodas and players place pagodas on coloured territories they have created, so the game is about area control. Players take turns placing 1 of the 3 tiles in their hand on the board next to any of the existing tiles. Each tile has 2 squares on it and each square can be red, yellow or blue. If a player creates a new contiguous territory of any single colour that consists of 2 squares or more, then they can claim that territory and place one of their pagodas on it. If a territory reaches 5 or more squares in size, then the owner adds a second pagoda to it. If a tile joins two or more territories of the same colour together, then owner of the new large territory is the player who owned the most of the squares being combined. Territories of 5+ in size can never be merged. In City Tycoon, players are building different building tiles in the same city. The player with the most victory points (VPs) when the game ends after 4 rounds is the winner. The city starts with several fixed tiles in the middle including a small power and small water plant which are neutral. 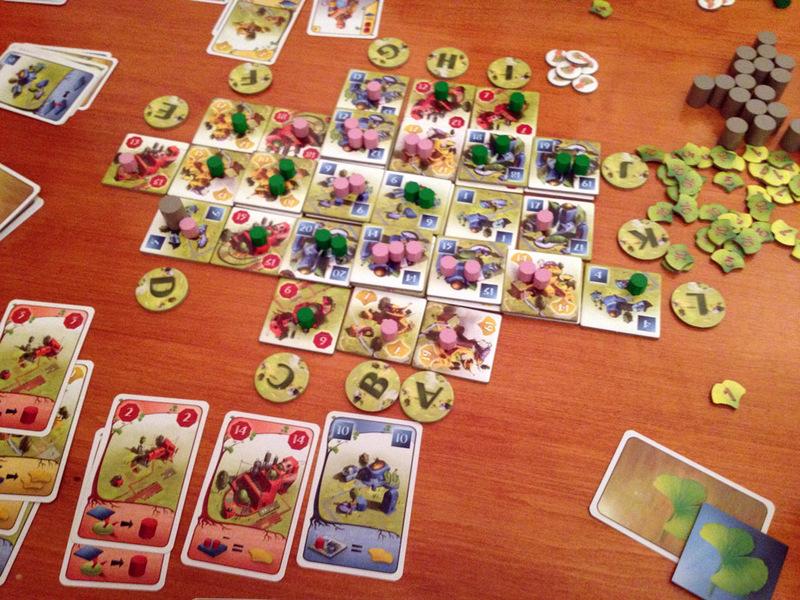 Each of the 4 rounds is split into 3 main phases: Selecting tiles, Building/Selling tiles, and Activating tiles. The tile selecting phase starts with each player being dealt 6 building tiles – players look at them, keep 1 tile and pass the rest to the player on their left. This process happens 6 times with each player picking 1 tile from those they were passed, so each player ends with 6 tiles, as well as knowledge of what other tiles other players will have this round. Sell: The player discards the tile and receives $5. Plant: The player discards the tile and can build the next available power or water generating plant tile (paying the cost marked on the plant tile and placing a marker on it to show they own it). 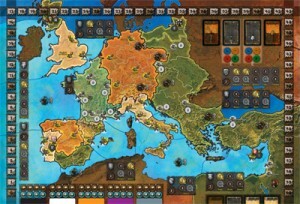 Rattus Cartus is a card game set in the world of medieval plague as is its sibling game, Rattus. It should make it clear that Rattus Cartus is not a card game version of the original Rattus game as, whilst is uses the same theme and art style, it has its own game mechanics. The goal is to earn the most victory points (VPs). At the end of the game, players score VPs based on how much influence they have with each of the 6 different character classes (10 VPs for having the most, 5Vps for 2nd most, and 2 VPs for third most influence). Some other VPs can be earned during the game too. 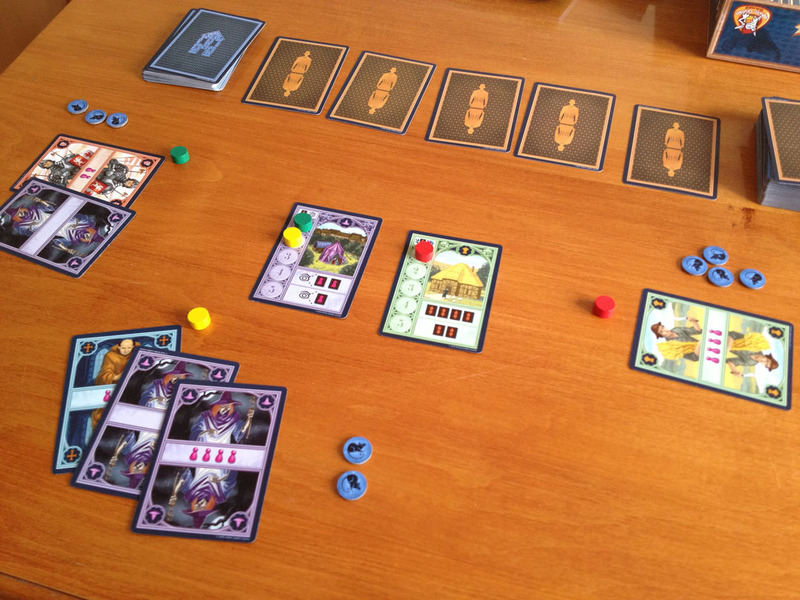 Oddville is a eurogame with a city building theme and a very compact game design. By that, I don’t mean its physical playing-size on the table; instead, I mean that the game mechanics are neatly compressed. 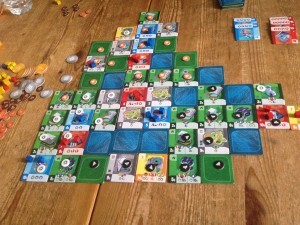 As a result, Oddville contains a clever, inventive design with more game than you may expect from a relatively short game. 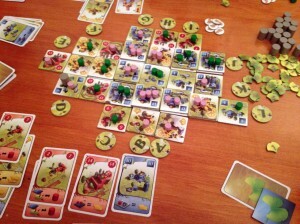 During the game player’s gain resources, money and characters as well as construct buildings so they can score the most victory points (VPs). 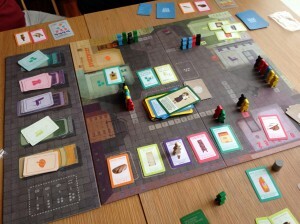 The game ends as soon as any player places their 6th worker in the city. Each player has their own deck of 4 action cards. 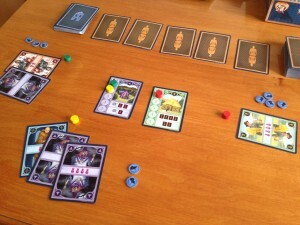 On their turn, a player can play 1 action card which allows them to either gain the cash shown, or gain 1 of the resources shown, or gain 1 building from the 6 building cards on display (the card affects the price). The cards range from strong to weak and the player gets these cards back once they have used all 4, or they can spend cash to get all used ones back (but the more cards still hand, the greater the cost). 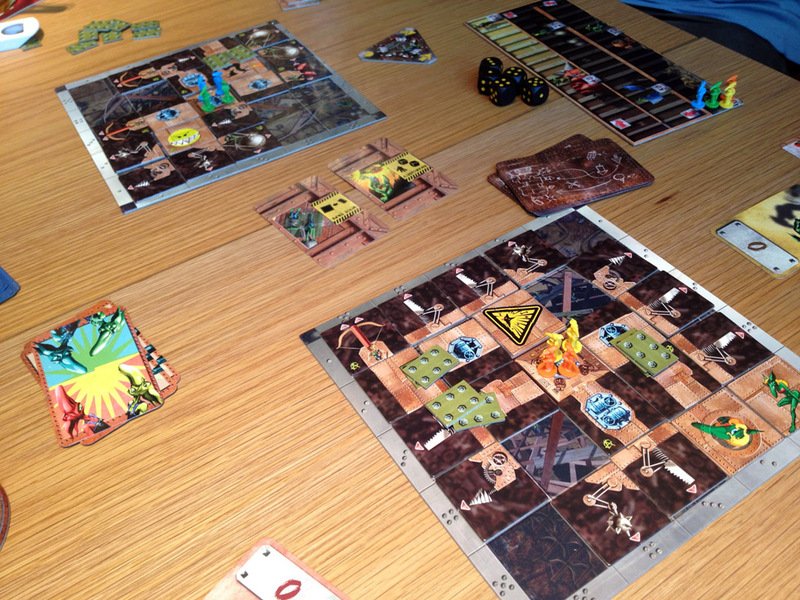 In Goblins Inc, players are goblins creating giant war robots that will fight each other. First, players are placed in random teams – these teams will change after the first fight and new robots are built by these new teams for the second (final) fight. The players who build a robot that wins a fight score victory points (VPs), plus players get individual VPs for their own hidden agenda cards. Before any building takes place, players draw 7 cards from their hidden agenda deck – just before the fight, players will choose just 4 of their 7 cards which will score them VPs once the fight is over. Hidden agenda cards award VPs based on (a) destroying specific types of tiles on the opponent’s robot, or (b) specific types of tiles not being blown off of your own robot), or (c) predicting which side will win. (Yes, you can predict the opponent to win and help it happen too). The player with the most VPs after two fights is the winner. 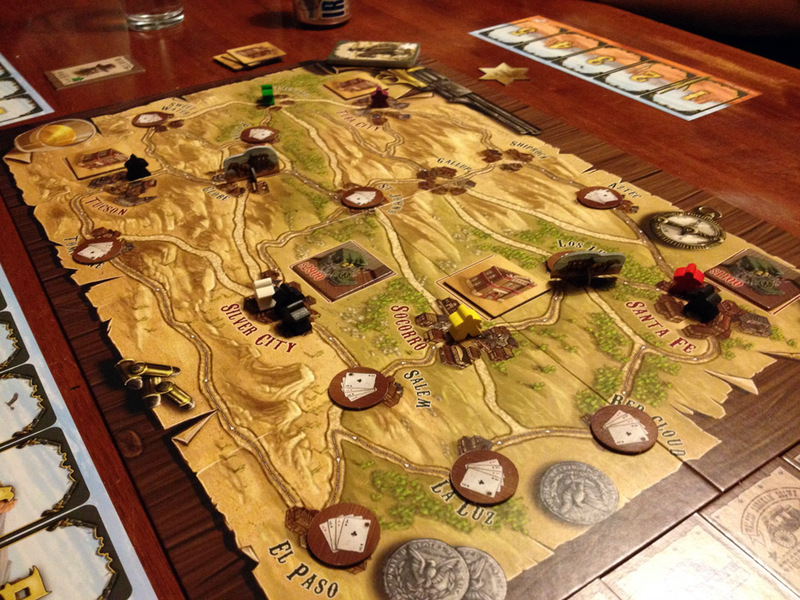 In Desperados, one player is the marshal trying to protect the Wild West from the other players who are all outlaws working together to rob banks, fix poker games and hold-up stage coaches. If the outlaws can gather a total of $4,000 for each outlaw player after 5 rounds, the outlaws win. The board shows various towns and cities connected by roads – towns have poker game tiles (worth $300-$600), cities have bank tiles (worth $500-$3,200), and stagecoaches move to towns and cities along pre-determined routes (worth $800-$1,200 when robbed). Note that the tiles are random and values hidden so outlaws don’t know exactly what they’re worth. 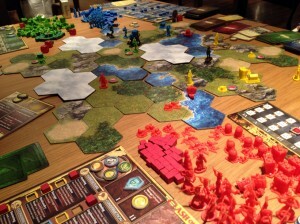 A player board can be seen at the bottom of the picture. Notice the cubes in the square holes marking the advances gained. Clash of Cultures is a civilisation building game by the designer of Merchants and Marauders and this sole fact meant it was on my ‘must play’ list as Merchants & Marauders was a superb game. In Clash of Cultures, players start as rival tribes in corners of the realm with no technology. 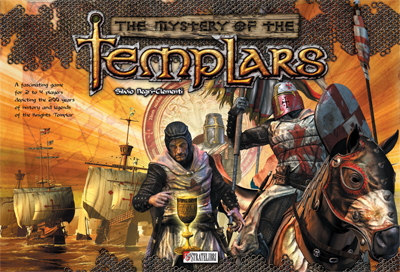 Over 6 rounds, the players explore the land, generate resources, build cities, create technologies, trade, potentially fight each other, and do whatever they can to be the most successful. 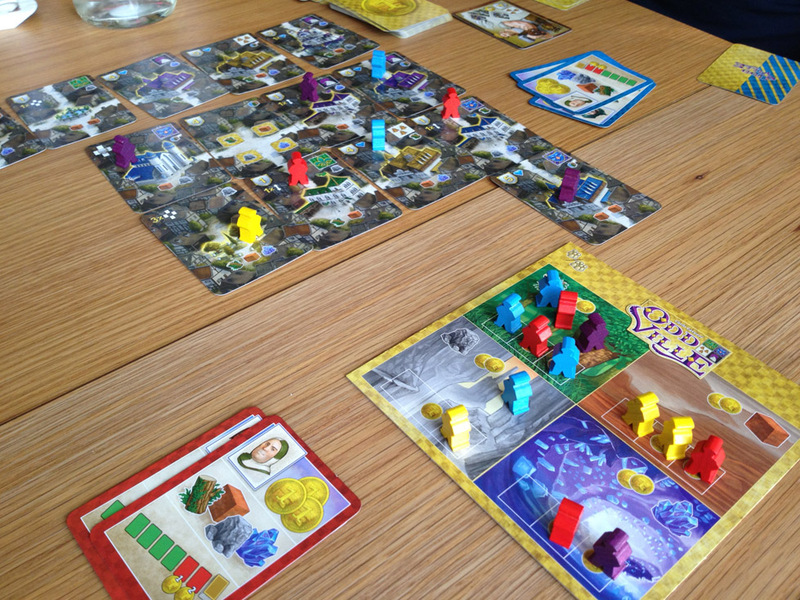 At the end of the game, victory points (VPs) are scored for building cities (1VP per piece), advances in technology (1/2VP each), completing objective cards (2VP each) and building wonders (5VP each) – the player with the most VPs wins. The board/map is made of tiles (each showing 4 hexes) of various types: water, mountains, barren, grassland, forest. Unexplored regions remain face-down until entered when a player turns the tile over and sometimes gets a choice on its orientation. 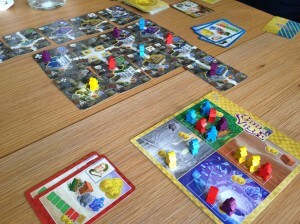 Ginkgopolis is by one of the designers I really like – Xavier Georges (Carson City, Royal Palace, Troyes and Tournay). Ginkgopolis is a game with the theme of futuristic, city building. As with many of Georges’ games, the game mechanic is a bit unusual (it’s actually relatively simple, although it may not seem so at first). As a result, I felt it important to explain the gameplay quite clearly (so please excuse the length of this review) because a brief outline would offer little insight. When someone suggests a game about queuing and shortages in Poland in the 1980’s, your first thought is probably to avoid eye contact and back away. However, Kolejka (which is Polish for ‘Queue’ and pronounced col-aay-ka) is actually a gem of a game which I hope gets the attention it deserves as it actually contains a great Eurogame as well as an interesting and fitting theme. Players are each trying to obtain 10 goods listed on their objective cards – for example, 4 luxury goods, 3 pieces of clothing, 2 food and 1 electrical. The first player to collect all of their items wins, or the player that collects the most of their items by the end of the game.